Douglas Benton is an officer in the Confederate Army during the Civil War. Sarah Duvall is a Virginian and the widow of a Union officer. She is known to be no friend to the rebel army. When the two meet in the presence of General Lee, Benton learns a secret—Duvall is a crucial spy in the war effort and partially responsible for his current command. Benton is put in the difficult position of protecting her, while not surrendering her secret. The two grow close in the process, eventually falling in love. 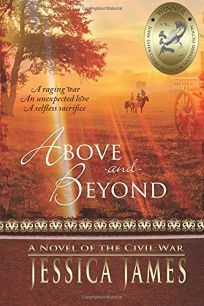 But when the Union Army discovers her secret, both Duvall and Benton's love and lives are put at risk. James has a skillful grasp of the more romanticized parts of the Civil War, but tends to gloss over its less glamorous aspects, drawing Benton and Duvall with broad strokes that will make them appealing to readers. At times, the plot struggles with contrivance, but readers who are engaged with the characters and their romance will find a lot to like.